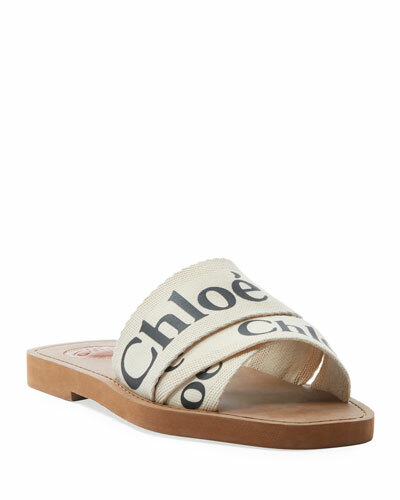 Founded in 1952, the French fashion house Chloe is best-known for timeless and free-spirited designs. Co-founder Gabhi Aghion created "dark beauty and bohemian spirit" in apparel that broke away from midcentury French fashion. The collection today is varied and consistently covetable. Neiman Marcus offers Chloe apparel, shoes, handbags, jewelry, sunglasses, and more. Akris small satchel bag in washed calf leather. Rolled top handles, 4.7" drop. Removable shoulder strap, 48"L. Two-way zip top closure. Exterior, side snaps expand bag. Interior, canvas lining; one zip pocket. 9.5"H x 17"W x 4.7"D. Protective feet. "Aimee" is imported. CALVIN KLEIN 205W39NYC pebbled leather camera bag. Adjustable shoulder strap, 20.1" drop. Two-way zip-around top closure. Exterior, logo biographical detail at front slip pocket. Slip pocket at back. Interior, one slip pocket. 6.3"H x 9.1"W x 3.1"D. Made in Italy.